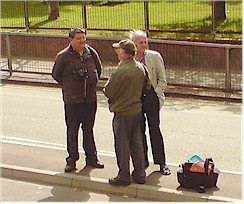 Today was Classic Bus Spotter Day - a chance for members of the public young and old to catch a glimpse of some rarely seen bus spotters on the streets of Worcester Park - many of whom only get brought in public once or twice a year. The weather was good, the public were out in force and there was plenty to see - my favourite being this 1952 bus spotter with trademark brown satchel. They just don't make them like that any more. Oh, and there were some old buses trundling around the streets of Worcester Park as well. Would you like to see some pictures of those?